The other night BrooklynLady went to her book club and my pal Adam came over for dinner, so I made a batch of Chinese-style braised oxtails. It may not sound like an appropriate dish for summer, but I think it works. Keep the portions reasonable and it's rather nice, actually, the scents of orange and star anise wafting through the house on a warm night. I enjoy pairing this and other dishes like it, with red Burgundy wines. The spicy and savory notes in the food bring out the same in the wine, and vice-versa. I particularly like the way the hoisin character of Chambolle-Musigny works with this kind of food, but I didn't have any in the house. A Gevrey-Chambertin perhaps, with its spicy earth notes would have been nice. But in the end I decided on a bottle from Nuits St. George, hoping that the sauvage nature of the wine might compliment the innate rusticity of oxtails. I chose the 2002 Domaine Henri Gouges Nuits St. Georges 1er Cru Les Chênes Carteaux, about $50 on release, Becky Wasserman Selections. I knew that it might not be ready to drink. Gouges wines, in general, require a lot of time in the cellar before revealing their charms. But I read a few tasting notes that implied that the wine might be approachable now. And if not, is that so terrible? There is this idea that there is an absolutely correct time to drink a wine, and if it is consumed before that time, a crime has been committed. What if the authority who decreed the prime drinking window enjoys wine differently from the way I do? What's wrong with drinking a wine early in its life - isn't a great wine great at all phases of its evolution? How else can we learn about prime drinking windows unless we risk opening bottles before they are ready, and learn for ourselves what makes them not ready? Adam and I both thought that the wine was excellent, although we both thought it would continue to improve with a few more years of cellaring. But really, that's picking nits, because the wine was expressive and welcoming. The fruit is dark and smoky, and is infused with a subtle but definite animale character. There are some underbrush aromas too, and just a touch of alcohol heat (13%). The palate was more expressive than the nose, with rich and gamy dark fruit that combines concentration with lightness of texture. As the wine moves back on the palate it tingles with good acidity, it shows a secondary earthy side, and there are delicate red cherry flavors that hang on ripe but somewhat rugged tannins. A lovely gamy perfume lingers after swallowing, inviting another messy bite of braised oxtail. Domaine Henri Gouges is thought of, alongside Domaine Robert Chevillon, as the top producer in Nuits St. Georges. I would add Domaine de L'Arlot to that list, but that's just my opinion. 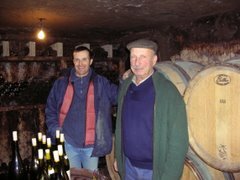 Domaine Henri Gouges, now run by cousins Pierre and Christian Gouges, owns parcels in all of the most important vineyards in the southern part of Nuits St. Georges. The 1er Cru vineyard Les Chênes Carteaux has rather illustrious neighbors. This map courtesy of Becky Wasserman's site, shows that Les Chênes Carteaux sits immediately to the west of Les Saint Georges, the vineyard that is considered to be the finest terroir in Nuits St. Georges, currently under consideration by INAO to be elevated to Grand Cru status. To the north is Les Vaucrains, another great terroir. Les Chênes Carteaux does not have the reputation of a top terroir, even though it is quite literally a stone's throw from Les Saint Georges and Les Vaucrains. Ah, the mysteries of Burgundy. But there is a silver lining - whereas a bottle of Henri Gouges Les Saint Georges now costs at least $125, Les Chênes Carteaux can be had for more like $65. Hardly inexpensive, but this is one of the top producers in the area, and that is what it now costs to explore 1er Cru wines from the Côte de Nuits. SIP INTO SUMMER WHITES WITH GEORGES DUBOEUF! IDEAS AND PARTY TIPS FOR THROWING YOUR OWN WHITE PARTY AT HOME New York (July 8, 2009) - Les Vins Georges Duboeuf was on the white carpet at summer's biggest White Party of the Season, Sean "Diddy" Combs' annual White Party, held July 4th at a private mansion in Beverly Hills. The 400 high wattage guests included: Ashton Kutcher, Demi Moore, Mariah Carey, Lindsay Lohan, Kim Kardashian, Khloe Kardashian, Lil Kim, Garcelle Beavais-Nilon, Shawn Wayans and Forest Whitaker. The Combs party featured stylized white bars, white sofas and coffee tables, white bean bag chairs, white beach blankets and balls, trapeze artists dressed in white, white cabanas, stilt walkers wearing white, jars of white candies from Dylan's Candy Lounge in New York, a revolving white dance floor and streams of sheer white fabric cascading around the long pool area. But, one does not have to be a celebrity to throw a fabulous white party, according to Duboeuf. "Summer whites extend beyond a crisp linen shirt, white jeans or a white cotton dress. The crisp lightness of summer whites can also be found in the white wines of France's Mâconnais region in Burgundy. 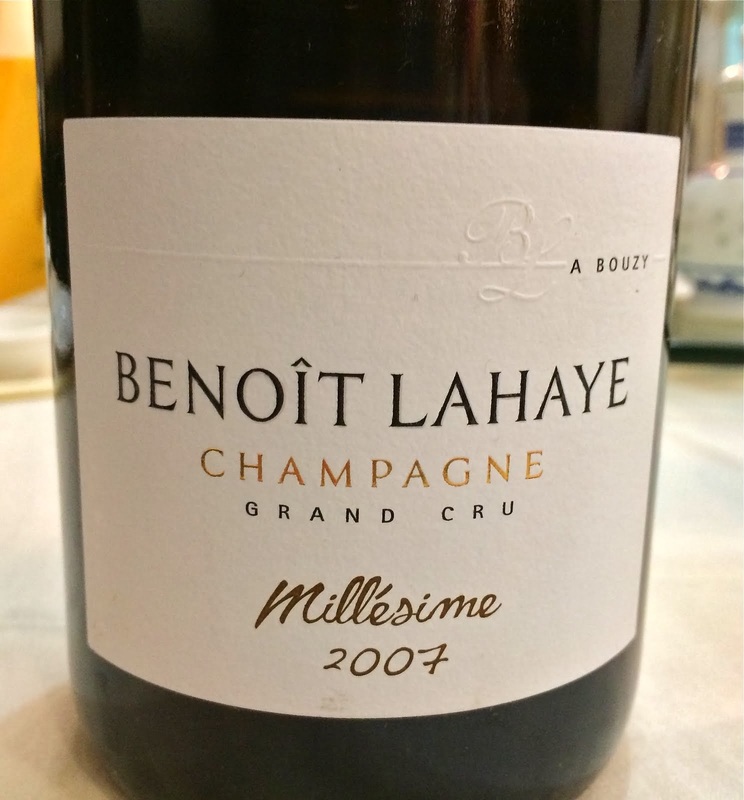 The wines are soft, yet supple and versatile with many summer foods from salads and ceviches to grilled fish and roast pork," said Georges Duboeuf. "They are perfect for easy summer entertaining." I am an avid reader of your blog, and I am really pleased about its content. My blog is called QVinho. It is a blog in Portuguese for the Brazilian aficionado for wine and gastronomy. We want to bring up to date info on wine tasting for the increasing Brazilian wine market. I would be grateful if I could have our blog included in your list of links. I was tempted to write back to Jomar because he clearly thinks of me as a friend, and also because he obviously really likes my blog. I just haven't gotten around to it yet. Hope you enjoyed these. If you have a blog, I bet you get them too. I promise not to do this again, unless something extra-specially insanely weird comes through. Spent the past several days with BrooklynLady and the kids in Rhode Island visiting family. I'm talking coastal Rhode Island, near Newport. This is classic New England. There are farms - cattle, horse, and vegetable. There are astonishingly beautiful rocky coastlines, sandy bluffs covered in long salty grasses, and creaky fishing boats. The houses are stately and tend to have worn cedar shingles that beg to be touched, as if they will reveal the scents of clam chowder and wood burning in the fire place. There are young men who, not being ironic, wear dress shirts tucked into bright pink pants and docksiders. There was a woman who used the expression "I'm as deaf as a haddock." Our older daughter played with a pail and shovel on the beach, and threw rocks into the water. We drank a lot of good coffee and a lot of good wine. It was incredibly quiet at night. We had a wonderful time. One evening BrooklynLady and I went with another couple to dinner at a restaurant called Pietra, in a town called Little Compton. I couldn't stop snickering at the fact that a town in this part of the world shares its name with Compton in Los Angeles, an entirely different kind of place to be sure. Anyway, there was one thing about the restaurant that I thought was fantastic - every single wine on their list was offered by the glass. The list wasn't huge, but it wasn't small either. Maybe 5-7 sparkling wines, 15-20 whites, and 15-20 reds. Some interesting selections too. I considered the 2004 Nicolas Joly Coulée de Serrant at about $25 per glass, but in the end had a glass of the 2007 Domaine Marc Kreydenweiss Gewurztraminer with lobster bisque (wine and bisque were both delicious), and a glass of the 2006 Billard Pere et Fils Auxey-Duresses Les Joncheres with braised lamb (wine was good, lamb merely okay). I love the idea of pouring everything by the glass. It allows everyone to drink exactly what they want, encourages experimentation, even with expensive wines, and allows for the enjoyment of several kinds of wine with the various courses of dinner. And the restaurant wins too - selling wine by the glass is more profitable for the restaurant than selling wine by the bottle. Or is it? Why don't restaurants offer all wines by the glass, instead of a select (and usually insipid) few? The obvious problem is simply that the restaurant cannot guarantee that the entire contents of the bottle will sell before the product loses its value. An inexpensive wine might sell quickly, but a more expensive wine, such as that Nicolas Joly Savennières - opening a bottle for my glass would probably result in a loss of money. Even though the wine improves for a week after opening. So how does Pietra do it - offering every wine by the glass? Perhaps they accept losses in selling certain wines by the glass, and make it up elsewhere, through expensive cocktails and inexpensive wines. Perhaps they aren't doing careful accounting. Who knows? I have never seen this before, a restaurant that offers every wine by the glass, although I have fantasized about running such a place myself. I want to know their secret. What are they doing with the stale Coulée de Serrant? Can this really be done, offering every wine by the glass, including the fancy stuff? The Savennières AOC is a small appellation, and a small group of producers makes most of the wine that hits US retail shelves. That list includes Château d'Epiré, Domaine du Closel, Domaine des Baumard, Roche aux Moines, and the famous and controversial Nicholas Joly. Damien Laureau is not one of these well known and often seen producers, although he should be, and I think inevitably will be. 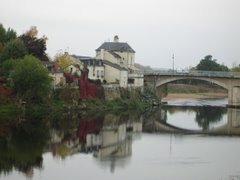 The village of Savennières is a very small place. BrooklynLady and I traveled there in 2006 to visit Domaine du Closel. We had no appointment and no idea where we were going, really. We got lost, went into a tabac (kind of like an Optimo meets a café, but with a liquor license) and in my broken French I asked if he knew the way to Domaine du Closel. A voice from near the magazine racks called out "I am Madame de Jessey of Domaine du Closel." This is a village with one tabac, a church, a bakery, a café, and a butcher/meat shop - the bare essentials for a French village, from what I can tell. Laureau is somewhat of a black sheep in Savennières, not entirely accepted by the old guard of growers. Why the outsider status? Damien Laureau is trying new things in Savennières, making wines that are fundamentally different. Savennières wines are world-class whites from Chenin Blanc, wines with enormous cellaring potential, but they are wines that can be austere in their youth, like a barren moonscape - nothing but rocks and sand. Most producers make several cuvées, and usually at least one of them is more approachable in its youth. But the producers who work with what are thought to be the best vineyards in Savennières - Clos du Papillon, Roche aux Moines, or Coulée de Serrant, for example, are making wines that are not very rewarding when young. Damien Laureau's wines are approachable when young. They are intensely mineral wines, but the fruit is beautiful from the beginning. He harvests a bit later than most people, allowing the grapes to turn yellow. But Laureau's wines are not sweet - they are bone dry, and at the alcohol level that is typical of the appellation, about 14%. Laureau experiments with a witches brew of plant-based sprays to ward off molds and rot. He keeps yields low, at 35 hl/ha whereas 50 hl/ha is common. Fermentation occurs with indigenous yeasts, and the wines spend over a year maturing on their lees. There are two cuvées. Les Genêts comes from a plot on top of a hill - you can see the vineyard in Bert's photos at Wine Terroirs. Le Bel Ouvrage is the top cuvée, the grapes grown on soils of sand and clay over schiste, and typically spends at least a year in barrel. I've had these wines a couple of times now, beginning with the 2002 vintage, and I think they're great, as good as anything I've had from Savennières. The one we drank this week was the finest yet, with a simple meal of pan-fried pork chops and bitter escarole. I have never had an aged example, and I look forward to it. Both the 2002 and the 2004 Bel Ouvrage seem like they will develop beautifully with cellar time. 2004 Damien Laureau Savennières Le Bel Ouvrage, $27, Jon David Headrick Selections. Definitely wound up, not revealing all of itself, and not at all settled, but gorgeous. The nose is a wall of wet rock, but with a little airtime shows classic beeswax and orchard fruit, fruit that leans towards pear and apple, very rich and subtly infused with spices. The palate is far more graceful than the nose at this point, although also less revealing. The fruit is ripe and mostly pear and apple, but there is an exotic pineapple note also. The acidity is vibrant and carries through to the finish, which really lingers with mineral and spice tones. This is a full bodied, rich, and concentrated wine, but also a graceful wine, one whose pieces are individually beautiful. With time in the cellar, when they harmonize better, this will be a majestic wine. If you are lucky enough to see this or any other Damien Laureau Savennières, you should just buy it. If you don't like it, you can put it on my tab. The other night we opened a bottle of the 2007 Weinhof Scheu Grauer Burgunder Kabinett Trocken, $16, Savio Soares Selections, a wine made from grapes perhaps better known to most of us as Pinot Gris. Imagine my surprise when there was no cork, no Stelvin (screw cap) closure either, no synthetic cork, but a little glass top that was vacuum sealed on the bottle. A little jiggling and it came out easily enough. And unlike a synthetic cork, I could easily re-seal the bottle using the same glass top. This thing is great, I think. Easy to open, easy to re-seal, much classier than a screw-cap, in my opinion. I wonder if allows a bit more oxygen than a screw-cap does to penetrate the seal? Anyway, I have never seen this kind of seal before. A little bit of searching the interwebs reveals that this alternative closure is called a Vino-Seal or a Vino-Lok. I prefer Vino-Lok, as it reminds me of a 1980's rapper's nom de guerre. In fact, I think that some one like Lyle Fass should seriously consider changing his name to Vino-Lok. That aside, I had never even heard of this. Apparently it's made by Alcoa, the aluminum production giant. And it costs more than other alternative seals. Like the screw cap, I'm sure this is meant for young-drinking wines, not the cellar-worthy stuff. I really liked it - the feel of opening and closing it, the look of it, the weight of it in my hand. And the wine was excellent too, which I'm attributing purely to the closure. Anyone else out there run into Vino-Lok? I don't mean the MC, I mean the alternative wine closure. Thoughts? You may have trouble believing what you're about to read here, but I assure you that it is the truth: there is a Bourgogne Blanc on the market now that will cost you between $15-$18, depending on where you live, that in my opinion offers the highest quality that I've encountered at that price point. This is a wine worth buying many bottles of, if you have the space. Yes, it is a great white Burgundy, and yes, I got mine for $15 a bottle. 2007 Thierry et Pascale Matrot Bourgogne Blanc, $15, Vineyard Brands Imports. You would know instantly that this is a Burgundy Chardonnay if it were served to you blind - it is that clean and true. The nose has great freshness, the citrus and Chardonnay fruit ripe and detailed, and saturated with stony minerals. Great purity on the palate, a blend of ripe fruit and bitter herbs and minerals. There is no midpalate fat, no fat anywhere really (except for on the just-opened nose). Not an overly extracted wine, not very broad. This is focused, ultra-pure and clean Burgundy Chardonnay, lean, but balanced and delicious. And at this price you can pour it rather liberally. The estate is located in Meursault, and there are over 5 hectares of Meursault villages classified vines, the estates largest holding. There are parcels in Saint Romain, Auxey-Duresses, and in several red wine spots, but the most important Thierry et Pascale Matrot wines come from small parcels in some big-shot Meursault and Puligny 1er Cru vineyards, including Meursault Perrières, Charmes, and Chevalières, and Puligny Les Garennes. Thierry Matrot took over for his father Pierre (who took over for his father Joseph) in 1983. He took the estate in a new direction, eventually going entirely organic as of 2000. Yields are carefully controlled via debudding and by using green harvests when necessary. All of the wines are fermented in oak using indiginous yeasts. Matrot is not inflexible, though, when it comes to work in the cellar. There have been vintages in which certain wines have been treated to reduce alcohol by up to half a percent, for example. That said, these are essentially naturally made wines in the focused and mineral driven style, that offer great purity and transparency. The Bourgogne Blanc comes from vines that average 30 years old right outside of Meursault. It has a Stelvin closure - a screwcap, which I think is great for a wine that is not meant for the cellar. It is always a good wine and a good value, but the 2007 is particularly exellent. This wine is not blanketing the shelves, but it's pretty easy to find in and around New York. Diageo Château and Estate Wines also imports the wines, so I imagine the wines should be elsewhere too. Pairing wine and food is something that, if approached seriously and with the right balance of art and science, can produce thrilling results. But a serious approach is not necessary in order to be thrilled by food and wine pairing. The idea that a person must be steeped in knowledge in order to participate is nonsense, and I think people are starting to free themselves of this burden. People seem to be more and more comfortable with the notion that wine doesn't have rules - that they can drink white wine with Lasagna if they feel like it, and that wine and food is really about pleasure, not pretension. I'm not trying to dumb down wine and food pairing. I think that our popular wine culture is close to going too far to denigrate as snobby the art of wine and food pairing. Overcompensating probably. It is snobby if a person is made to feel that they are wrong to make a certain pairing, or that their lack of knowledge should prevent them from happily participating. But it is not snobby to suggest that there is an art to pairing food and wine, and that a bit of practice and perhaps some study can produce great results. I think that wine is like chess, jazz, baseball, and many other things that are easy to enjoy, but are still complex things. Wine can be enjoyed by just about anyone - it tastes and feels good. It's something that people all over the world drink with dinner. But like chess, jazz, or baseball, wine rewards careful attention in that its deeper intricacies are revealed only to those who spend enough time "practicing." And even for those who practice a lot, not everyone will experience the deepest pleasures of these things because there is a degree of talent involved. Luckily, we can enjoy without too much practice. But the practice is fun, and that's why you're reading this blog, isn't it? It's why I write this blog, anyway - it helps me practice and get even more pleasure from wine. This has been a rather long winded way of getting to my point: I am essentially clueless when it comes to pairing wine and cheese. I understand that cheese helps to tame tannins in wine, like milk in black tea. And I am familiar with some classic pairings. But I don't know why certain wines work better than others with certain cheeses. And when I plan dinners at my house, the most uncomfortable part for me is picking wine to go with the cheeses I am serving. I know a little about cheese, more about wine, but I know almost nothing about how to make them work together. I enjoy all of my attempts, but I know enough to know that I don't know anything. I'm even confused about what to me is the most basic issue: red or white wine? I decided that I'm going to use the light dinners on hot nights this summer to practice some more with wine and cheese. I'll read some, but I warn you - I'm going to just open different bottles with various cheeses and see what works for me and my friends. So there. I started last week with a classic pairing - Loire goat cheese with a Loire Sauvignon Blanc. Sancerre is probably the most heralded wine to use, but I wanted a more humble wine. At Ten Bells a few weeks ago I asked the bartender to pick a wine to enjoy with their wild boar sausage. She picked a declassified Cheverny, now a Vin de Table, a blend of Gamay and Pinot Noir by Christian Venier,a Loire hipster-natural-wine-biodynamic-producer. It was utterly delicious. There was no wild streak like in Puzelat's wines, but there was a volatility to the wine, particularly to the alcohol component. Served cool out of the wine fridge I just loved it, and it was perfect with the thinly sliced sausage. So why not Venier's Sauvignon Blanc? We sat on the deck on a lovely summer evening with a bottle of the 2007 Christian Venier Touraine Le Gautrie Sauvignon, $17, Savio Soares Selections, and a well known Loire Valley (from nearby Poitou, actually, but close enough) goat cheese called Le Chevrot. It is not young cheese, and not an aged cheese either - somewhere in the middle. The center of the pate (the 'dough' of the cheese - check out Fork & Bottle for great cheese info, tasting notes, and fancy terms like pate) is snow-white and chalky, and the outer part is creamy and yellow, but not runny, even at room temperature. The wine paired well and was lovely, although not as stunning an example of Loire Sauvignon Blanc as Venier's VdT is as a Cheverny. We had a great time that evening, and as Morgan Freeman said to his Captain at the beginning of the movie Se7en: "There will be more of these." And by the way, our lily that blooms for only a few days each spring finally bloomed. We noticed it while enjoying our goat cheese and Sauvignon. It should have happened over a month ago but there has been so much rain, everything is all out of whack with the plants. I drink quite a bit of red wine from Chinon, but mostly the wines of one producer, Bernard Baudry. This wasn't always the case. I used to buy and drink wines by many different Chinon producers, but I learned after a while that I like Baudry's wines much more than the others, and now I rarely stray. I just checked my cellar notes and 19 out the last 23 bottles of Chinon that I drank at home were Baudry wines. I don't want to be one of those people who always go to the same restaurant, and then always order the same dish. Is that what I've become, with Chinon? There's nothing wrong with drinking what you like, but it's important to try new things, to stay informed, to step away from what is well known from time to time. Even if the results are not so satisfying, the fun is in the experimentation. Well, I am happy to report that I've found a Chinon producer who's wine I like enough to purchase - Wilfrid Rousse. Rousse is a new producer who established the estate in 1987 in the village of Savigny-en-Véron, not far from Chinon itself. Farming is organic, although the estate is not yet certified. Rousse allows natural ground cover on some plots, and plows others. Yields are kept at 45 hl/ha maximum, and wines are fermented in tank. This is a vigneron who is still establishing himself, and who seems to be doing the right things in the vineyards and in the cellar. I've had two different cuvées with meals, and I've also tasted through the whole lineup, and I really like the wines. They are in the concentrated style, modern in their total lack of rusticity and greeness, but old school in their mineral-driven and transparent expression of terroir. There are five red cuvées and a rosé, each based on different soils. perhaps the best value in the portfolio is the youngest wine, fresh and fruity Les Galuches. 2008 Wilfrid Rousse Chinon Les Galuches, $16, Savio Soares Selections. The vines are planted in sandy gravelly soils, and are not older than 15 years. This wine is bottled in the spring after the harvest, and although it is a fruity and delicious wine, it is not a simple wine. The sense of soil is prominent on the nose and on the palate. Gravel and graphite on the nose, some dark fruit, the tiniest amount of burnt earth too. Really lovely on the palate, well balanced, redolent of iron and blood, ripe fruit, and bright acidity. A great example of modern Chinon - nicely ripe and extracted, and still definitely of its place. This doesn't have the depth of Baudry's Les Granges, but it is a delicious wine with lovely fruit, and it has a great gravelly character. I'm not trading in all of my Baudry and replacing it with Rousse's wines, but I will very happily drink this wine or the other Rousse cuvées when I see them. They are delicious, serious wines, and worth trying. A good friend and his wife recently went to Amsterdam for a wedding. My friend's birthday is July 4th and they would be going out to dinner at a highly recommended restaurant called Bordewijk. He emailed me from Amsterdam to ask me to suggest wine from the list, something he would enjoy on his birthday dinner. You can see the list by clicking on the second word from the left, "wijnhaart," I think it says, on the website's subject bar. It is an interesting list with good options at all price points. There were several things that caught my eye, but one that really stood out. Can you guess what wine I recommended to my friend? I recently had the distinct pleasure of participating in the Wine & Spirits Burgundy tasting panel. There were several days, each with more than one session of tasting. I participated in two of them. In one session we tasted Meursault, 21 wines from the 2007 vintage. There were also some reds from the Côte de Beaune during that session, but really it was about 2007 Meursault. In another session we tasted 40 red wines from the 2006 and 2007 vintages, all from the Côte de Nuits. I love the Wine & Spirits tasting format. Wines are served blind - you know it is a 2007 Meursault, or perhaps a 2007 Meursault 1er Cru, but that's it. You taste in flights of anywhere from 2 to 7 wines, make notes on your own, and then discuss with the panel. I learn so much from these things, I cannot even tell you. --Surprise, surprise...I like Pierre Morey's wines. I also like Thierry et Pascal Matrot's wines. Domaine Leflaive's too. And I learned that I like the old school, piercing and earthy Meursault of Domaine Faiveley, in 2007 at least. --These wines are not easy to taste. 2007 was a classic (read - normal) vintage in Burgundy, and the acid levels are high. 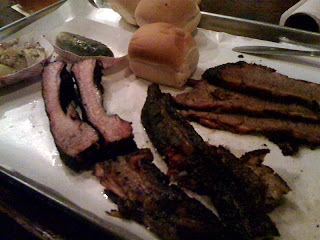 My teeth and gums, my whole mouth really, was a stripped down bloody mess after this tasting. Okay, no blood, but you get my point. --I tasted all of the Pierre Morey 2007's out of barrels in December of 2008. They were utterly gorgeous. In the bottle they are not as lovely. Not yet, at least. I also found this to be true in early May when the Wilson Daniels tasting roadshow stopped in New York. Pierre Morey poured his wines and I was shocked at how difficult they were, unruly in their acidity, their gawkiness of fruit, their total lack of serenity. I have no doubt whatsoever that these wines will be completely beautiful given time and proper cellaring. But this was a valuable lesson for me in the difference between tasting from a barrel, and tasting the same young wine from a bottle. --The wines of Bouchard Pere et Fils, Drouin, Louis Jadot, Laboure-Roi, and Louis Latour are not the wines that make me love red Burgundy so deeply. I was worried because there honestly was only one wine in the entire tasting that I found to be remarkable, and only a few that I really liked. But when the wines were unveiled, there was no Fourrier, no Mugneret-Gibourg, nothing remotely like that. Basically all big négoce houses. Nothing wrong with that, but that part of Burgundy not what captivates me, and a blind tasting bore this out. --We tasted 10 wines from Nuits St. Georges, 4 from Chambolle-Musigny, 4 from Vosne-Romanée, 16 from Gevrey-Chambertin, 3 from Clos de Vougeot, 2 Bonnes Mares, a Chapelle-Chambertin and a Chambertin Clos de Beze. It was enlightening and so gratifying to see the differences between these amazing terroirs. Even though we're talking about big négoce houses, there were distinct differences in the general character of the wines from Nuits St. Georges and Vosne-Romanée, for example. And the three Clos Vougeot wines all had a certain potent muskiness that united them. Even the big houses in Burgundy makes wines of terroir, I guess. --The 2006 Louis Jadot Bonnes Mares is a beautiful wine, with characteristic umami notes, great depth, and layers of deeply pitched and classy mineral-infused fruit. The palate is a bit backward, but the materials are all there, and there is great structure. At about $180, there are other wines I might buy instead of this one, but I would leap at the chance to drink this wine again. I've lived in New York essentially for my whole life (there were four years of college in the mid-west and a year in Southeast Asia and India). I've never seen a June like the one we just had, with rain almost every day, skies overcast. We had 18 days straight of rain at one stretch. But you know what - it's still summer, and I'm taking every chance I get to treat it as such. For example, the other day while my daughters were both down for their mid-day nap, even though the sky was white, and the air thick and humid, I found myself thinking of rosé and tapenade. Probably because Bert of Wine Terroirs and I had been emailing recently about the glory of Bandol wine, and I recently re-read his post about this classic Provence pairing. Bert says that it is easy to make tapenade - all you need is some olives, garlic, anchovies, capers, and lemon juice. A food processor helps, although a mortar and pestle is fine too. My kids nap for about two hours in the middle of the day. Could I make tapenade, enjoy it under gray skies on our deck, and still get some work done while they sleep? The answer, I'm happy to tell you, is yes. Not a bad lunch on a humid and gray day. A food processor would help. I used just over 6 ounces of pitted kalamata olives, one large garlic clove, two anchovy filets, about two tablespoons of capers, and the juice from half a lemon. I don't have a food processor, although we've been meaning to buy one for months. The mortar and pestle was fine though. Start by pounding the garlic with the anchovies and capers. I buy capers packed in salt usually, but for this dish it seemed better to buy a jar of large capers packed in water. Put the creamy garlic/caper mash in a bowl, then pound the olives - I had to do this in two batches. Add the olives to the caper/garlic/anchovy mash, and add the lemon juice. Stir well, and spread on slices of a baguette. My tapenade was not as creamy as Bert's, but there's only so much you can do with olives in a mortar and pestle. And coarse tapenade tastes great too. The sun poked through the clouds as I was choosing a rosé, and I realized that celestial forces were telling me to open the very best Provençal rosé that we have. There are many fine rosés from Bandol, and every Bandol lover has his or her own favorite. Right now, mine is Terrebrune, and so I opened a bottle of the 2007 Domaine de Terrebrune Bandol Rosé, $25, Kermit Lynch Imports. Bert wrote a truly great profile of Terrebrune, and I won't waste space paraphrasing him. Just look at that gorgeous orange color. Terrebrune's rosé is made from the same low-yield, top quality Mourvèdre as is the estate's famous red wine. It offers rich and delicious fruit, and also a strong sense of the mineral soils that make up Terrbrune's vineyards near the sea. It is a rosé that typically benefits from cellaring. In fact, in its youth it can be quite wound up and intense, even difficult to drink. It has the classic and beautiful color that many Bandol Mourvèdre based rosés have, a deep coppery orange. The 2007 Terrebrune rosé is 50% Mourvèdre, 30% Grenache, and 20% Cinsault. The nose is tense with minerals at first, and opens up to to reveal herb-infused fruit, 7 hours later the lavender is quite clear. The oxidative nature of this wine gives the fruit an orangey character that contrasts nicely with the tension of the minerals and herbs. I saved two-thirds of this bottle to enjoy with BrooklynLady that evening, and I don't think the nose ever finished opening, although it certainly was lovely. This wine really glides across the palate with great textural richness. It is not heavy or sweet, but it is an intense and big rosé, with sunny seaside fruit flavors, a metallic mineral frame, and a nostril-filling fragrance. It demands food, and it worked perfectly with the assertive flavors of the tapenade. I hope I have the self control to cellar one or both of my remaining bottles of this wine. I would love to see how it evolves with say, 10 years. But it's just so good now, this will not be an easy task. By the way, one thing that I particularly love about Terrebrune's wines is that they defy the trend towards higher alcohol in Provence. Not just the rosé, the red Bandol too. The 2005, the current vintage on NYC shelves, is a completely reasonable 13% alcohol. Perhaps wine maker Reynald Delille is using modern equipment to de-alcohol-ize the wine? Unlikely. But I would love to attend a presentation in which he and other Bandol producers discuss vineyard work, cellar work, and alcohol levels in Bandol over the past 15 years.